Most of the bad business decisions that confront entrepreneurs and small business owners are driven by a combination of lack of preparation, and lack of time for making said decisions. Let me share an example: Call any Real Estate Brokerage Owner and ask them to send you their Administrator Hiring Policy, in other words the 4 to 8 page document that explains the Administrative position in details; the qualifications required; the details of all the duties; the software mastery required; the training they will need to undergo; the benefits of the position; and the procedures required throughout the year. Few will have one on hand, and fewer yet will have a document detailed enough to cover all aspect of the position. Bad decisions usually arise when the current employee decides to quits, or is befallen by an accident or major illness - you see the Business Owner had plenty of time to prepare when he or she had the existing Administrator; yet did not plan for such eventuality in their Business Blueprint, and now will be rushed and end up doing a poor job hiring the replacement. 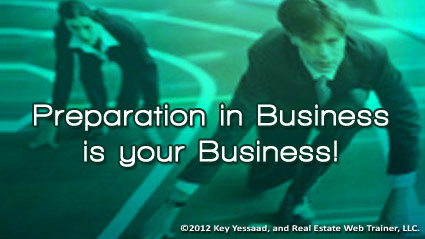 So my question to you: what would you work on right now to prepare for a business event that you know will befall you?